This Pico Genie M100 completes the ultimate gamer paradise...and it's ultra portable too. Are you a keen console gamer? An Xbox junkie? PS3 obsessive? Wii addict? Personal Projector have the ultimate gaming setup to share with you. Imagine 'Call of Duty: Black Ops' or 'Test Drive Unlimited 2', on a 100 inch projected screen. How's that for immersive gameplay? What about 'Marvel vs Capcom' or 'Killzone 3'? All you need is a white wall or portable desktop screen and the new Pico Genie M100 Palm Projector. The exciting new Pico Genie portable projector is the perfect addition to any gaming setup – offering up to 100 inch immersive gameplay with excellent image quality provided by hi-res XGA and 110 lumens of brightness. At an outstanding price of £399, this gaming gadget is a more affordable and more practical (and far lighter at only 500g!) alternative to a 100 inch TV. With excellent connectivity options (HDMI, SD, USB and VGA, Audio Out for mini speakers) it can also be used with plenty of other devices such as your laptop and DVD player – for both boardroom presentations and mindblowing movie nights! Just launched and available exclusively from Personal Projector, the Pico Genie M100 micro palm projector really does take gaming to the next level. You can read the full spec and purchase the M100 here. Got a question, feedback or a projector / gaming related story to tell us - get in touch! Check out our high fidelity 'pod' mini speaker - a recommended Pico Genie M100 accessory for gaming. This entry was posted in Just for Fun, Personal Projector Blog and tagged Platform 32, gaming, gamer, ps3 projector, xbox projector, console projector, gaming projector, Pico Genie M100 Palm Projector, mobile projector, Jason Bradbury, The Gadget Show, Pico Genie M100, Pico Genie, small projector, portable projector, pocket projector review, Personal Projector, palm projector review, palm projector, mini projector review, mini projector, micro projector, LED projector, handheld projector on February 23, 2011 by sam. - No colour or image degradation - the quality of image projected from a bulb projector will degrade from the first time it is used whereas LED gives consistently high quality from the first day until the last day you use the projector. This entry was posted in Personal Projector Blog and tagged Pico Genie M400 wireless, M100, office projector, Wireless, mobile projector, 3M MP180 Projector, 3M Projector, iphone projector, smartphone projector, lamp projector, LED projectors, 3M MP180 Pocket projector, Pico Genie M100, Pico Genie, travel projector, small projector, portable projector, pocket projector, pico projector, Personal Projector, palm projector, mini projector, micro projector, LED projector, handheld projector on February 17, 2011 by sam. When choosing an LED portable projector, one of the most important factors to consider is image quality. Often this is judged on brightness (lumens) alone, but it is crucial that other related specification details are evaluated too. For example, we assess contrast ratio, resolution, DLP capability, lens type, design/build and independent reviews – in addition to the projector’s luminosity. For example, the Pico Genie P100 is not the only 85 lumen projector available, yet the image quality it provides is far superior due to brightness on battery and excellent build quality. Based on the specifications for each of our products, we have ranked our current products according to their overall image quality - see below. This allows you to conveniently compare the image quality of our portable projectors. Please note that the following ranking reflects image quality alone and does not reflect other features such as size and connectivity. The Ranking (with '1' being awarded the best image quality). We hope the product ranking results will assist you in choosing an LED Projector. As specialists, we're always happy to help you find the right portable projector for your requirements - contact us. Find out about our 'compare projectors' facility here, which you may also find useful. This entry was posted in Personal Projector Blog and tagged Pico Genie P50pro, Pico Genie m400, Qumi Q2 Lite, Pico Genie P50, Pico Genie M300, Pico Genie P100, Vivitek Qumi, mobile projector, the best portable projector, the best palm projector, the best pocket projector, the best pico projector, image quality, 3M MP180, BenQ JoyB GP1, Samsung SPF10, Casio XJA, LED projector image quality, portable projector review, portable projector image quality, palm projector image quality, pocket projector image quality, Pico Genie M100, Pico Genie, Aiptek V50, travel projector, small projector, portable projector, pocket projector review, pocket projector, pico projector, Personal Projector, palm projector review, palm projector, mini projector, micro projector, LED projector review, LED projector, iGo UP2020, handheld projector, Adapt Pico Play, Adapt 305 on February 17, 2011 by oliver. We have had a large number of pico projector customers intending to use the technology abroad for travel, charity or missionary work because they are so lightweight and portable. Most being battery powered, they are perfect for taking to remote areas. One recent customer told us of how she carried her micro projector in a satchel on the back of a motorbike in South America - they are hardy little gadgets! What with pocket projectors having excellent connectivity such as USB, SD Card or onboard memory, they really can be taken anywhere to share media. 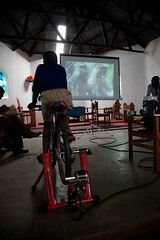 Those behind the 'Pedal Powered Cinema' in this charity project were Electric Pedals. Electric Pedals are renowned experts in the world of pedal power and have been involved in a wide range of projects and run workshops creating people powered energy solutions. They recently appeared on BBC1′s Human Power Station. 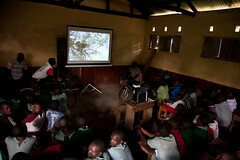 As LED projector specialists at Personal Projector, it is always inspiring to see them put to good use by charity workers heading out to locations such as Africa. Feel free to get in touch to tell us about projects you might be involved in, or if we can assist you in selecting a portable projector from our range appropriate to your requirements - no matter how adventurous! This entry was posted in Personal Projector Blog and tagged mobile projector, South America, Africa, The Great Ape Initiative, electric pedals, missionary work, charity work, charity projector, travel projector, small projector, portable projector, pocket projector, pico projector, Personal Projector, palm projector, mini projector, micro projector, LED projector on February 15, 2011 by sam. The wait is over! Today, Personal Projector are proudly launching the revolutionary 3M MP180 Pocket Projector. This pocket projector is the best pocket projector business tool to date, ticking all the boxes, and then some. This portable projector offers wifi, bluetooth, 2hr battery life, 4GB memory, touchscreen and is supports Microsoft Office. Imagine yourself easily surfing the web, or transferring your files from your smartphone or laptop wirelessly via bluetooth. Present your Powerpoint presentation or Excel document, navigating with the state-of-the-art touchscreen interface. For something so small and portable, the MP180 really allows you to make a big impression! In this blog, we will present to you a gallery of exciting new images, explore the 3M mP180 micro projector specification in more detail, provide the Personal Projector Verdict/First Review and showcase the impressive 3M promo video. This really is the pocket projector everyone's been waiting for! See for yourself the impressive specification on this pocket projector! We've broken it down into the categories most important to consider when purchasing a portable projector. Brightness: 30 lumens of brightness produces a large 80" screen size. Power: A full 2 hour battery life makes the MP180 the ultimate pocket projector. Media: Download content from your favourite digital media sources: PCs, DVD players, digital cameras and mobiles. Convenience: Transfer your files by either Bluetooth connection or conventional cables... and go! Web browsing: Access web pages and project streamed content via MP180’s enabled Wi-Fi. Browsing is best with mobile-enabled sites. Control: 2.4" LED touch screen provides straightforward navigation. Sound: Fully equipped with 1.5 Watt integral speakers. Alternatively, connect to external speakers. Office: Built-in apps for projecting popular business software including Adobe PDF, Microsoft Word, PowerPoint and Excel. Storage: A full 4GB of built-in memory and a micro SD card slot for expanded memory. We're excited to launch the 3M MP180 Pocket Projector - a revolutionary product which combines so many great features! We love the look and feel of the new 3M pico projector, particularly the stylish touchscreen interface. Meanwhile, on a practical level the MP180 pocket projector provides an outstanding delivery. Fully supporting Microsoft Office files, you can conveniently deliver your presentations in the boardroom or on the go - without a cable in sight (due to great battery life and onboard storage...bluetooth and wifi!). No wires, no chaos - just convenience...simply plug and play. We think that the MP180 brings together in its spec so many positives that it really cannot be praised enough. This entry was posted in Personal Projector Blog and tagged 3m mp180 buy here, the times 3m mp180, the times, the Times pocket projector review, mobile projector, bluetooth projector, touchscreen projector, wifi projector, 3M MP180 Review, 3M MPro 180, 3M MP180 Pocket projector review, 3M MP180 Pocket projector, 3M Pocket projector, 3M, business projector, travel projector, small projector, projector without laptop, portable projector, pocket projector review, pocket projector, pico projector, Personal Projector, palm projector review, no bulb projector, mini projector, micro projector, LED projector, handheld projector, business projector review, 3m micro projector on February 11, 2011 by sam. What does The Gadget Show’s Jason Bradbury think of our Pico Genie Projectors and Screens? For two weeks, Jason Bradbury has been holed up in a hotel room - in between filming sessions for the BBC's new Saturday night gameshow, Don't Scare the Hare. what I love about that little Pico Genie M100 is the HDMI in. Picture quality & luminescence is stunning for it's size. It's great to have such positive feedback on the 'mad-good' Pico Genie M100 Palm Projector and Pico Genie Portable Projector Screens from The Gadget Show guru. More updates coming soon. In the mean time, why not follow us on Twitter where we are busy tweeting about the latest pocket projector developments, special offers and tech news and of course answering all your questions... Find out more about the Pico Genie M100 and Screens here. This entry was posted in Just for Fun, Personal Projector Blog and tagged mobile projector, Jason Bradbury, The Gadget Show, Pico Genie Palm Projector, Pico Genie Screen, Pico Genie M100, Pico Genie, small projector, portable projector, pocket projector review, pocket projector, pico projector, Personal Projector, palm projector, mini projector, micro projector, LED projector on February 2, 2011 by sam. Android Projectors: What does this mean? How do they work? Break Away From Cables With The Wireless HDMI! Vivitek NovoDS Cloud V1.3.1 Adds Some Great New Features!